In this post I will briefly address the claims by the apologist Richard Bushey, who seems to have created this apologetics website in the hopes of making apologetics easy, and the conclusion that god exists and atheists being wrong a foregone conclusion. According to Bushey, we are cowardly and in denial. Let's see what he has to say. This is a common apologetics cliche. It falls into the category of prescriptivism, where a definition prescribes reality, instead of the other way around. Definitions follow usage, and as such the label "atheist" is used by most atheists as meaning "a person who does not believe in god". Bushey ignores the subcategories of atheism in his desperation to pass on the burden of proof, which apologetics arguments are woefully inadequate at meeting. I myself am a strong atheist, but this is not relevant at all. This is simply not true. The reason most atheists give for not believing in god is that they find the proposition "god exists" to be unconvincing, due to things like false Bible stories, the contradictions of yahweh, and a general lack of physical evidence that such a god does exist. Bushey is misrepresenting his opponents. Standard fare for apologists. Next, Bushey tries to appeal to properly basic beliefs. Appeals to personal experience have many problems. People have had personal experiences of alien abductions, psychic surgery, ghosts, bigfoot, and Penn & Teller catching bullets with their teeth. If personal experience were the sole basis for valid beliefs, how would we reconcile the contradictory personal experiences of different people, especially those that have religious experiences of different deities? Is Bushey promoting some sort of relativism? His next charge, that some evidence be provided for a hallucination, is exactly what we get when there are contradictory personal experiences reported by people. They can't all be right, but they can all be wrong. The latter seems more likely. The second error in this section is the idea that belief in a god is as obvious as the existence of a living, breathing person. 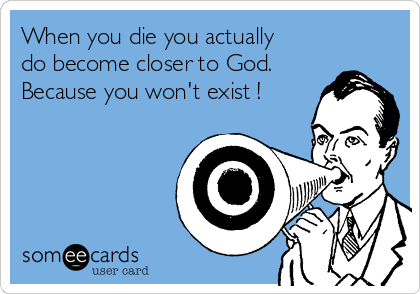 I would agree that if god was as evident as another living breathing person that there would need to be good reasons to not believe in the existence of that person. If that person however does not present themselves in physical reality, sends messages telepathically that contradict each other, and chronicles its adventures in a wildly inaccurate book written by primates, I would think that disbelieving the existence of such a person does not strain reason at all. I think I speak for most atheists when I say we don't want more evidence. We want good evidence. Quantity is not a substitute for quality, and most arguments for god suffer from serious deficiencies and crippling objections. Worse yet, none of the evidence of the tangible kind that we have become accustomed to coming from the sciences. Next, Bushey asks us to prove a universal negative. Bushey's example is suspect. A square and circle are defined as being mutually exclusive. A square circle does not exist by definition. However, we can say that an omni-benevolent god that commands genocide, approves of slavery and sits idly by while natural disasters and disease cause massive amounts of suffering does seem absurd. I wonder what Bushey considers a good explanation to be? When we consider explanations, good ones tell us something more about what they are explaining, and are not merely pointers as to their causation. Such explanations are not good explanations because they don't tell us anything useful. We don't learn anything from DNA by saying that god did it. Good explanations also have the advantage of having good evidence in themselves, and are not just cardboard causes that are selected. This explanation for the facts of the universe is similar to saying that the illuminati caused the financial collapse of 2008. It really doesn't bring us any closer to understanding anything, and no good evidence that the illuminati actually exists. Since no sound case for the existence of god has been presented that I know of, I don't see how atheists are responsible for convincing believers. If believers don't self reflect on what they consider evidence, and are unwilling to recognize the flaws of their own position, it's not the job of atheists to spoonfeed them with arguments. Besides that fact, atheists have been making their case for a long time, and there are many great resources to this effect. Saying that atheists refuse to present a case is just a lie, and it's wrapped in more misrepresentations and caricatures of atheists that don't accomplish anything but preaching to the converted. I suppose in that regard, Bushey has done a fine job. It is unfortunate too that the title of his post, namely why believers should not bare any burden of proof, was not even close to adequately argued for.